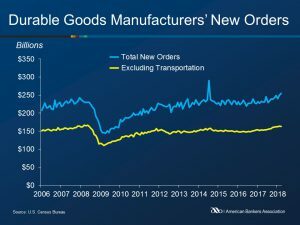 New orders for manufactured durable goods increased 2.6% in March to $254.9 billion, following a 3.5% February rise, according to the U.S. Census Bureau. Transportation equipment offset sluggish growth in other areas, rising 7.6% to $91.4 billion over the month. Commercial aircraft was the largest contributor to transportation, increasing 44.5% to $21.0 billion. New orders excluding the volatile transportation sector were unchanged. New orders excluding defense rose 2.8% on the month, while orders of nondefense capital goods surged 6.0% to $83.1 billion. Shipments of manufactured durable goods, rose 0.3% to $250.0 billion. This followed a 0.7% increase in February. Inventories of manufactured durable goods continued to rise, growing 0.1% to $411.0 billion. This followed a 0.4% February increase and led to growth in twenty of the last twenty-one months.